Whether you desire a spa-style sanctuary, sleek minimalism or a bathroom from yesteryear, planning is the first step in making your dreams turn into reality. But, be warned – for all of the enjoyment you can have developing your space and style, a bathroom can be deceptively tricky to get right. Before you create a wish list of all the things you want in your bathroom, you need to be clear on how the bathroom will be used and by whom. Are you planning a master bathroom that can easily accommodate two users during the morning rush? Or are you planning a guest bathroom to be used only once in a while? A bathroom used by children needs to be planned quite differently to one that is used solely by adults, and all of these considerations will affect not only size, but layout as well. Regardless of the number of people using the bathroom, one rule of thumb is to ensure that there is a comfortable flow throughout the room during its most busy periods. If you can open your arms wide and not knock into the next person while you move through the space, there is a good chance you won’t be falling over one another when things get really hectic. Another quick way of determining the overall size of your bathroom is to decide whether you want both a bath and shower, or just a shower. 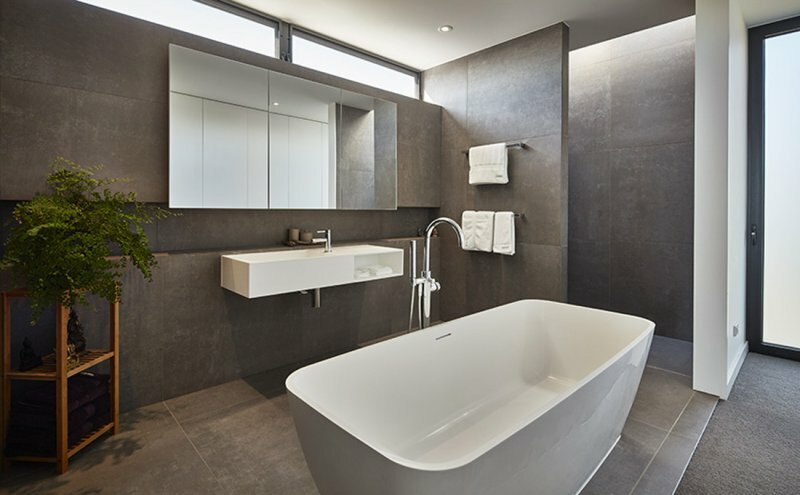 If your design includes a bath, a myriad of different sizes and installations – each with distinct layout requirements – will come into play. An inset bath often becomes a stunning feature with additional tiling or even its own alcove, while a free–standing bath needs space so that it can become its own focal point. Whatever size and shape you choose, keep in mind that the more walls that contain plumbing pipes, the higher the price tag – limiting plumbing to one wall is often the best way not to blow your budget. 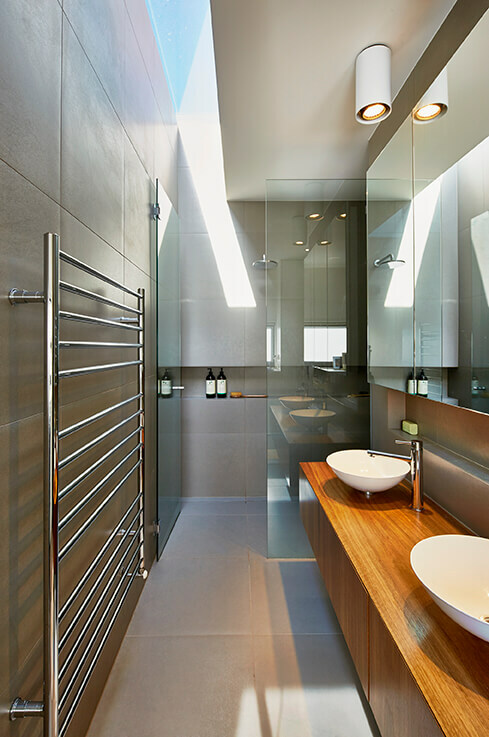 Showers have also evolved to become focal points that dictate the overall style of the room. 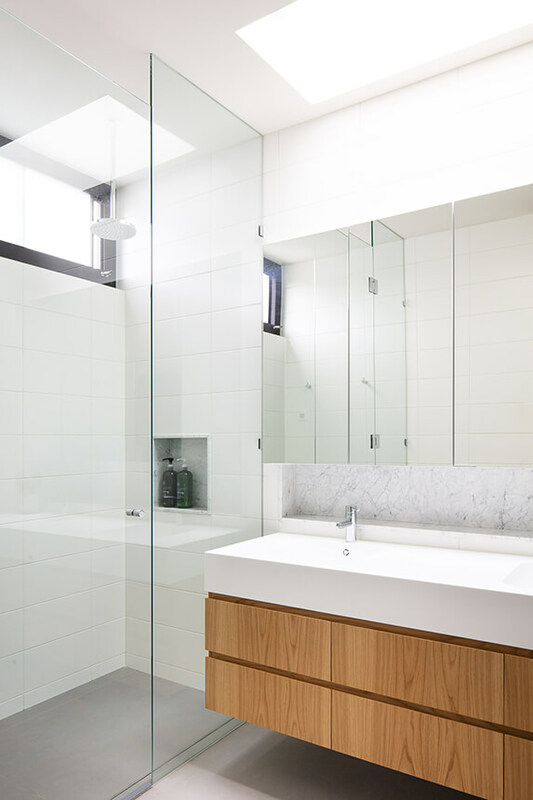 Walk in showers with a ‘barely there’ feel and wet rooms with benches and multi-head enclosures have come a long way from the traditional glass enclosed box for one person. 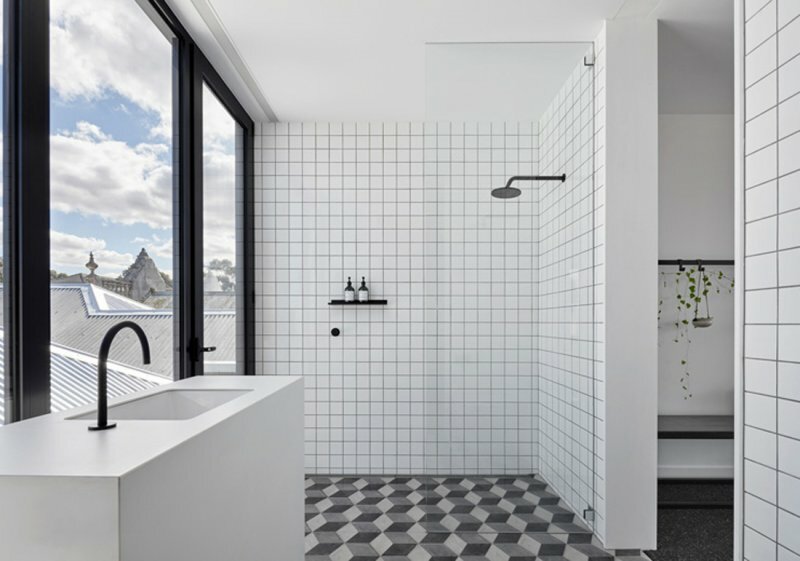 With seemingly endless choices regarding construction, materials and configuration, many architects recommend that it is wise to overestimate the size of your shower so that you have flexibility with form and function down the track. When considering storage, a good starting point is listing what you require and mapping out your own processes for using these items. Hopping out of a shower and having to walk across the bathroom for towels or products can quickly become tiresome – not to mention slippery. And the access you require for make-up and toiletries is often dictated by how you sequentially prepare yourself for the day or night. Most vanities combine drawer and shelf space for essentials, but nearly all of us also rely on medicine cabinets, shelving, towel racks, hidden waste baskets and additional draws to accommodate our needs. With striking new ideas and concepts at every conceivable price point, it is often hard to choose the right combination of sinks, faucets, showerheads and toilets – the trends of today always at risk of becoming the eyesores of tomorrow. So much so, that while fashionable fixtures can seem very alluring, an investment in high quality, long-lasting products will rarely be regretted. With new models and new functionality, it is easy to get swept up in installing the latest and greatest. 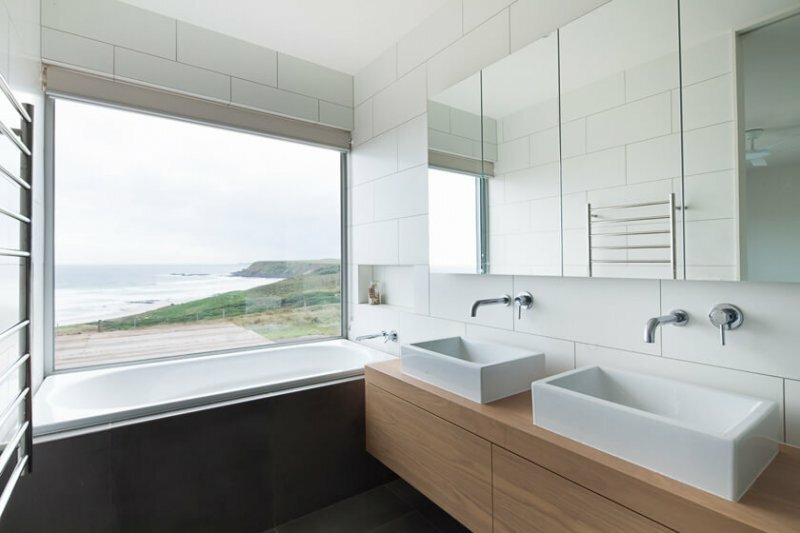 Instead, faucets that fit the overall style of your bathroom should be prioritised, in particular, ones that are made of high quality material that will perform ‘as new’ across their entire lifespan. Much like faucets, the choice in sinks is almost endless. Vanity top sinks, coming in all shapes and sizes, can be the most budget-friendly and easy to install. While, under-mount sinks – attached below the counter’s surface – blend very well with stone countertops and other solid surfaces. Integral sinks made from the same material as the countertop, while more expensive, often give a sleek look. 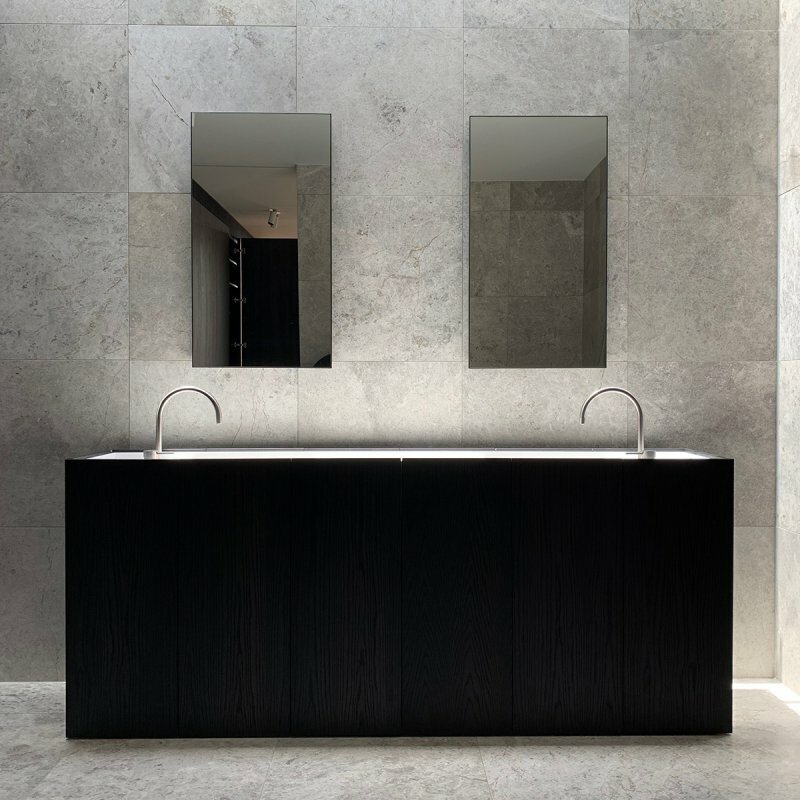 And wall hung or pedestal sinks can use less space while being striking from a design point of view. When it comes to shower heads it is always a good idea to consider wall-mounted options. Additional hand held features can always be added to give a luxury-spa feel to the area, but rarely should be the only option. While ceiling mounted showerheads and body sprays that can be used to create amazingly relaxing and therapeutic bathing experiences are great if you can budget for the additional plumbing costs. As toilets account for nearly 30 percent of residential water usage, one of the first things you should consider is using less water without sacrificing performance. WELS is Australia’s Water Efficiency Labelling Scheme and allows consumers to compare the water efficiency of different products. With newer models able to save about 55 percent less water than a conventional model, it makes sense to invest in 6 star rated models. From a functionality point of view, thought should also be given to leaving enough room around your toilet for access and cleaning – a one-piece toilet being both stylish and sensible due to its compact size and easy sanitisation. As the level of design has increased within bathrooms so has the complexity of lighting schemes. A good lighting plan is therefore essential to accentuate different spaces and foster different moods while including lighting for specific tasks. As bathrooms are generally used for grooming, hardworking task lighting at the vanities is essential and can be mounted either side of your mirror or within the mirror itself. While within a shower only dim lighting may be required for you to perform bathing and beauty routines. Overall ambient lighting can be hidden in alcoves or become a statement with a pendant light or chandelier. What matters is what you want to accentuate and which activities you wish to perform. 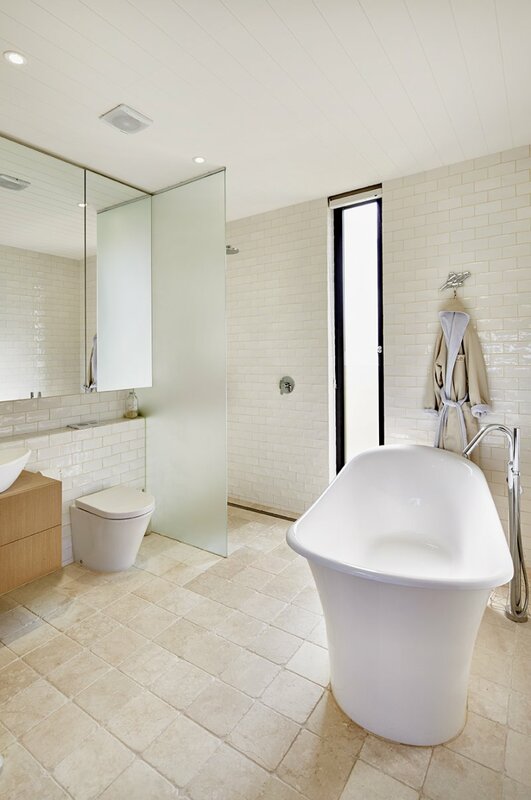 We’d love to chat about your bathroom design ideas, so please feel free to contact us on 03 9316 6000 or info@modscape.com.au to talk to a member of our expert design team.